Wedding rings can be almost any style imaginable. Forty years ago wide bands were in and these were often diamond cut with bright shiny stars, diagonals and circles covering the entire surface. The bright cutting didn’t need diamonds to make the surface sparkle but over the years these sharp bright cuts become softened and dulled from wear, and polishing only further softened the once reflective mirror-like cuts. Twenty five years ago, we sold mostly plain narrower bands with sometimes milled edges or maybe daringly, a tiny star set diamond. Two colour bands became popular with a white middle and yellow edges, or a white band with yellow inlays. Then came more diamonds, but spread out as a line of 3 or five stones across the top. They were usually flush set with no claws or grains to hold them , set instead with a continuous wall of the surrounding metal, carefully pushed down over the stones edge. 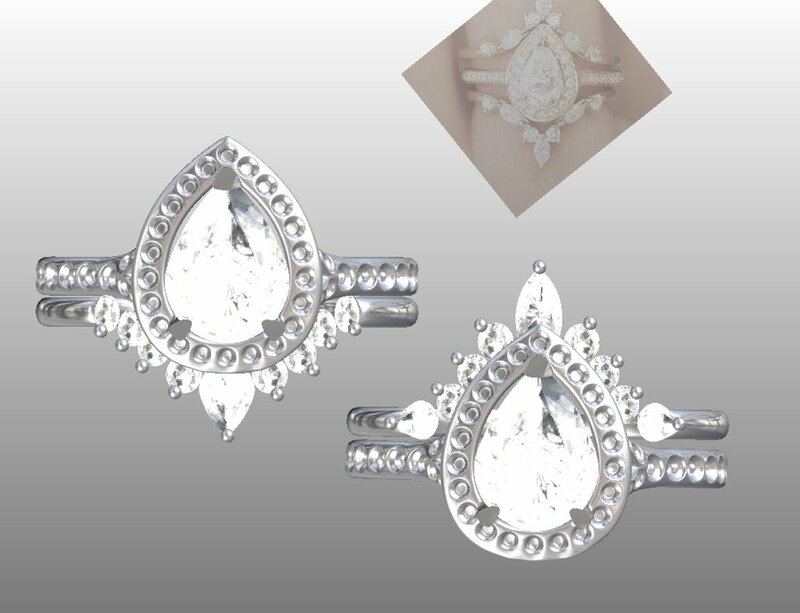 Starting in the USA we began to see flush set diamonds all the way around the ring and alternating the position from one side to the other in a continuing zig-zag. 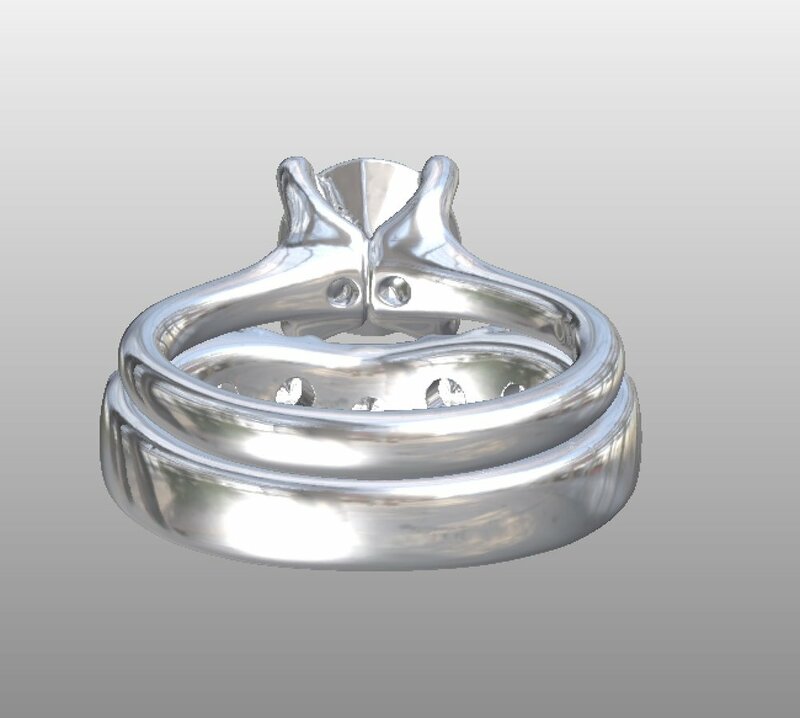 Occasionally we made shaped bands that hugged the contours of a twist design engagement ring but mostly they were straight - at the time there was no easy way to make a shaped-to-fit band. 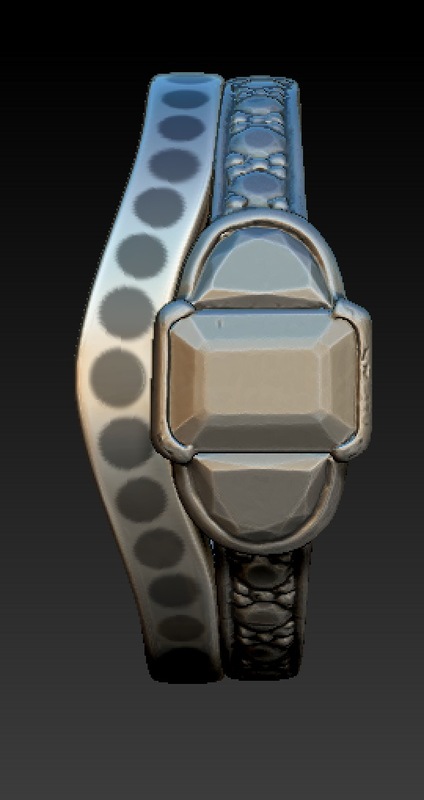 With the onset of cad design and a growing thirst for more and more diamonds, things began to change. We began making engagement rings that were designed to allow a straight wedding ring to fit right up close without being pushed away by a protruding collet or underbezel. Initially these “wed-fit” rings were solitaires but we soon learnt to make 3 stones and cluster rings that could still allow enough space under the head of the ring for a wedding ring to fit snuggly. Diamond set wedding rings became as popular as plain ones and began looking like eternity rings with stones usually set from a 33% to a 100% spread around the ring. The overall width went down from 3mm to nearer 2mm and narrower although these are sold with a caveat that they need be worn with more care and removed when doing anything too damaging to a fine band. 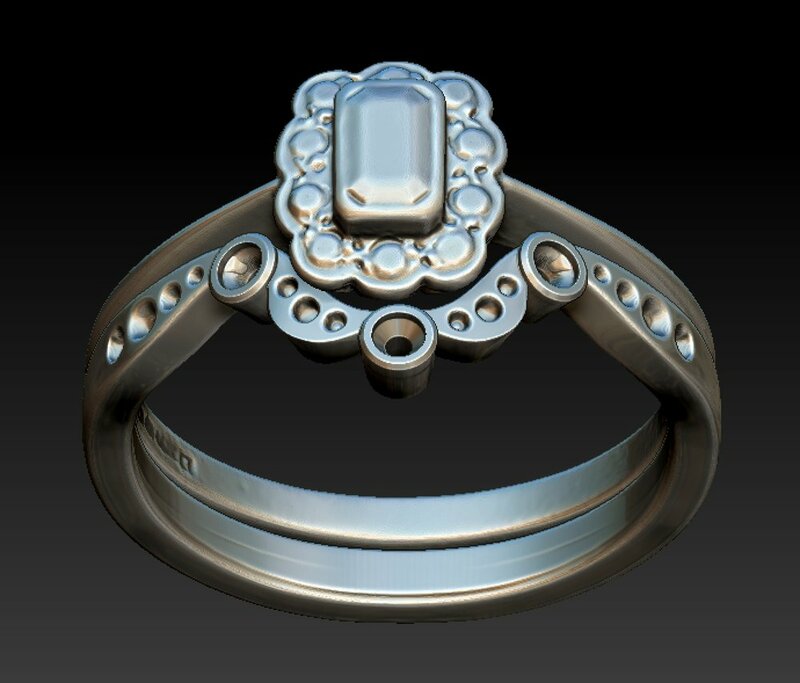 Today with our skilled designers and use of CAD we can usually match up the profile, stone size, style of setting, and feel of an engagement ring with a new wedding ring. 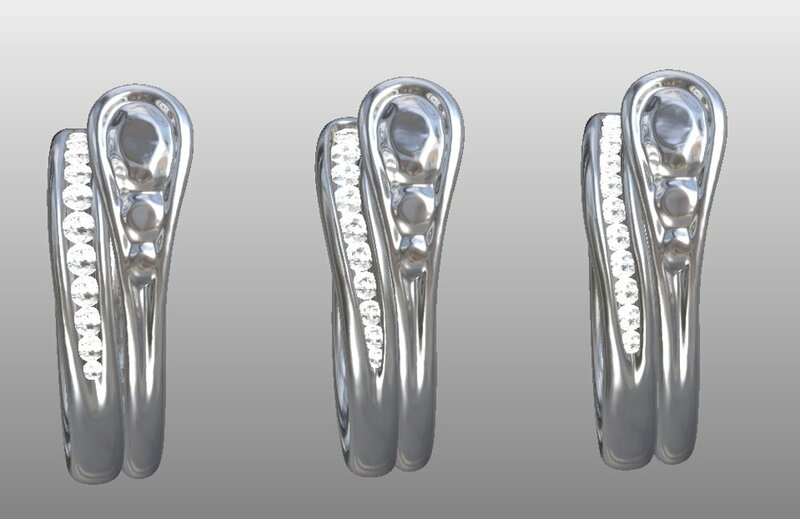 With our 3d scanner we are able to scan your engagement ring so that an interesting curve on the layout of the engagement ring can have a perfectly fitting band against it. Once we have completed a scan, it makes it much easier for us to make a surprise eternity ring that also fits perfectly at some future date! Echoing the delicate lacework of the Edwardian era, which had influenced a whole style of jewellery that is again popular today, our foliate bands are set with tiny diamonds, finely engraved and millegrained. 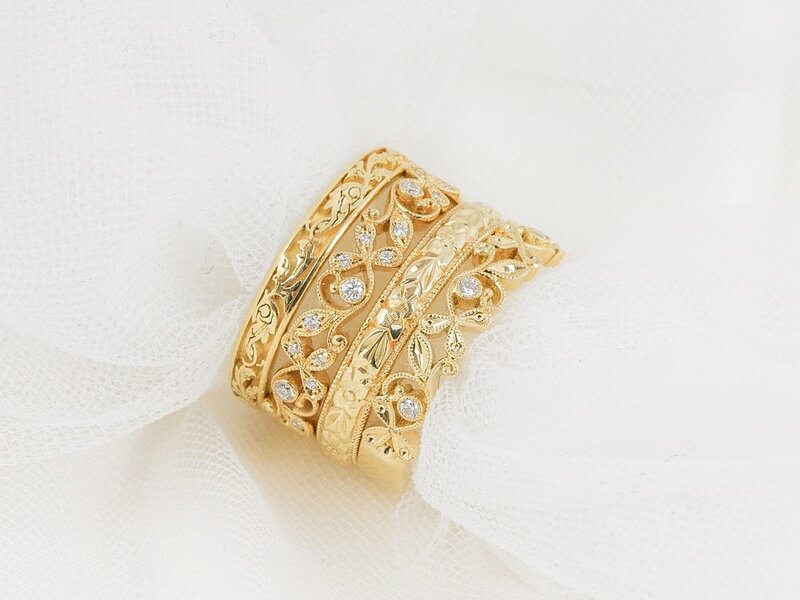 A selection of yellow gold engraved and diamond set foliate wedding rings. How do you get a wedding ring that can fit closely to your engagement ring? Some engagement rings allow a snug fit without any shaping of the wedding band and if this is the case and assuming that you would like to match the precious metal, then you really only need to think about the width, cross-section and depth of the ring. We usually try to fix the depth of the wedding ring to match the depth at the half way point of the shank (band) of the engagement ring - as rings are usually viewed whilst looking downwards, the depth at this point is what is noticed and any differences in shape and weight can easily be seen. So if your engagement ring has a cross section that measures 1.7mm deep at the half way point and is also D-shaped in cross-section, then a matching wedding ring would also be D-shaped and have an even depth of 1.7mm. The width of the band is sometimes the same or more usually a little wider and is more of a matter of personal taste. Diamond set bands are more often the same width as the shoulder of the engagement ring if they are to match closely. Here we made the fitted diamond set foliate scroll wedding band that had to match a wavy and diamond set band on the engagement ring. You can just see the recess which allows the two rings to fit together whilst still maintaining the wave pattern through both the rings. If however you have an engagement ring that doesn’t sit well with a straight band then this could be where having a shaped band will best suit you. Sometimes just a slight wave in a straight band will be enough. 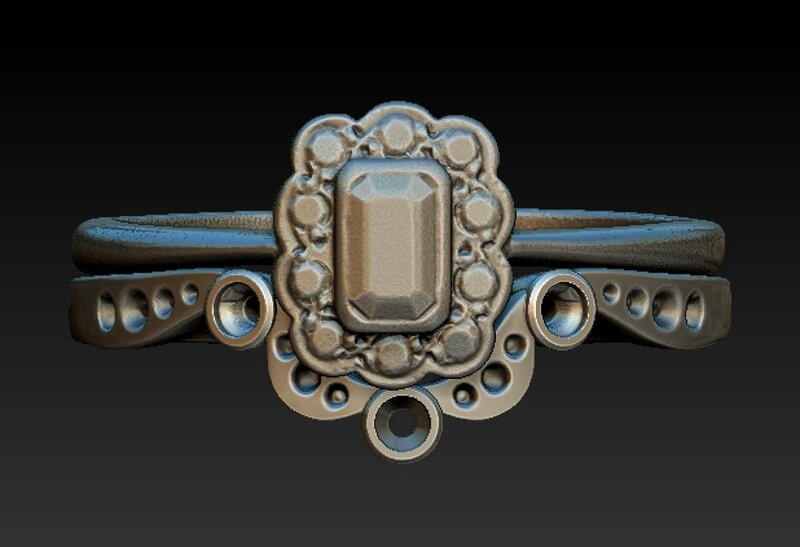 Other times a slight wave might not be enough and instead the wedding band will need to shape around a rings head. 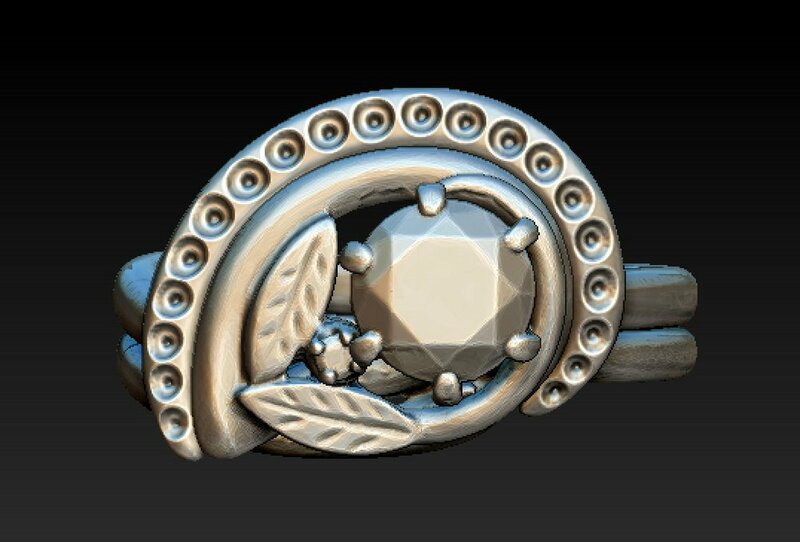 Video of making a shaped wedding ring around the scanned tiara engagement ring - CAD work. 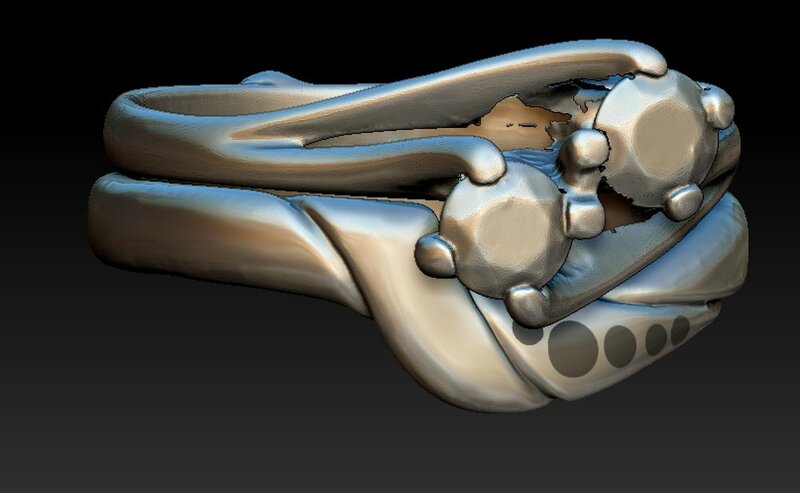 This is where a 3d scan of your engagement ring would allow our cad designers to design a close fitting shaped band and you can see the design and have it tweaked until it really works for you. 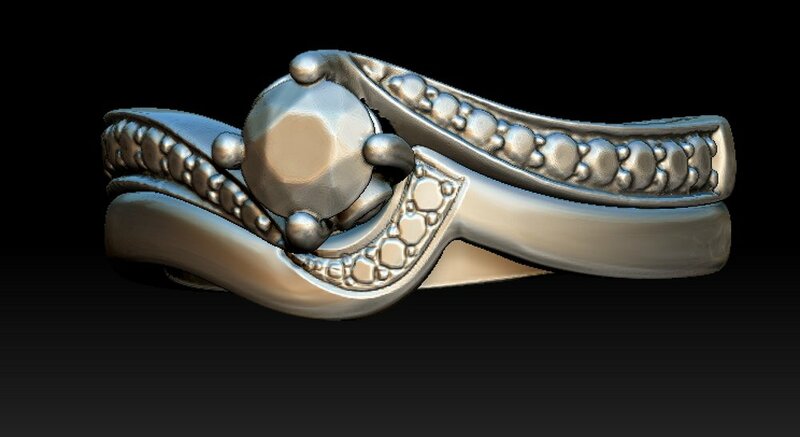 Below we have added some working images of some of the many fitted wedding rings we have made over the last few years. 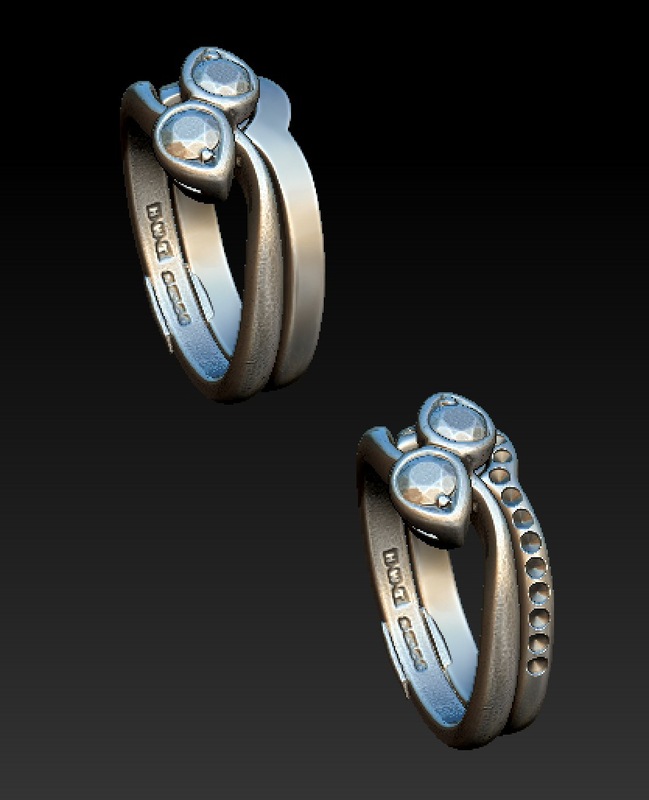 Some show scanned engagement rings which have been brought into one of our cad programs, and some others where we were working with a previously made (by us) cad file for the engagement ring. 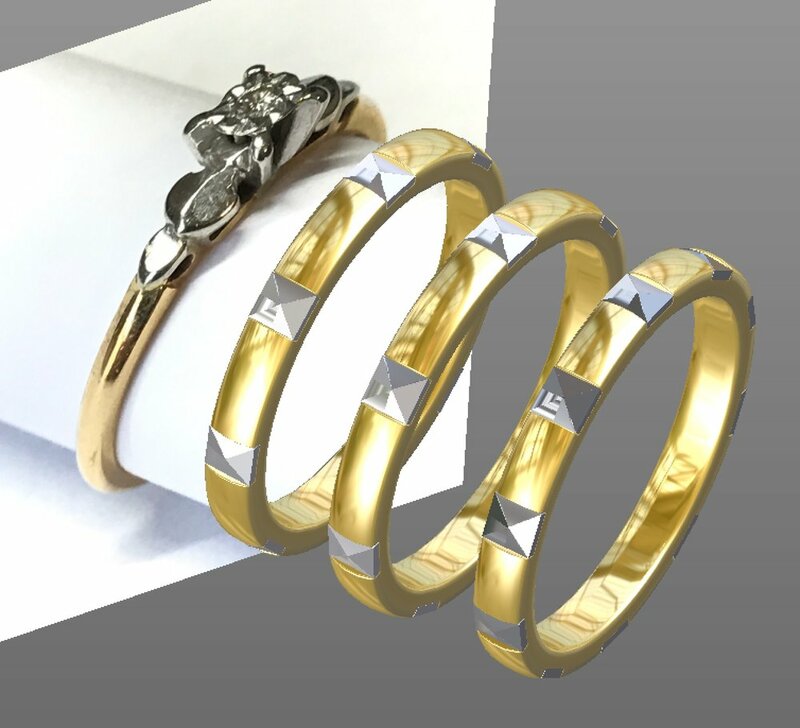 We have many years experience in making fitted bands and matching wedding rings. 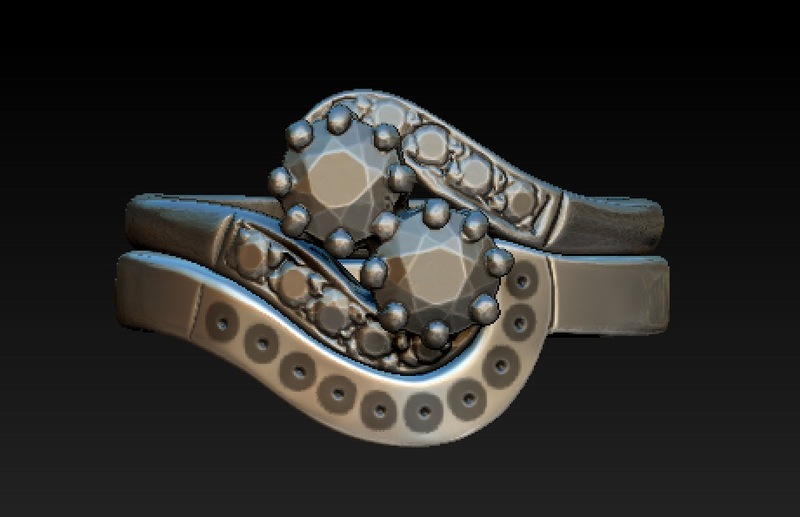 We don’t need to send your rings away from Chichester to be scanned and we have the skills and knowledge in our workshops to make the very best ring you could hope for. Whether you are opting for a simple band, shaped band or diamond set version, come and talk to us. Russian style wedding ring containing the three colour golds, Yellow, White and Rose. Gents concave wedding ring, mobeus diamond set band, diamond band and platinum and 22ct scroll engraved band.